Sauvignon Blanc wine that will enhance your enjoyment and understanding that will enhance your enjoyment and understanding of this white wine of distinction. Learn more about each guide and find buying options below. & the Sauvignon Blanc grape! Buy the complete set and get a deluxe slipcover and one tasting note pad, absolutely free! to Sauvignon Blanc wine & the Sauvignon Blanc grape! 61 cm) and printed on heavy poster stock. 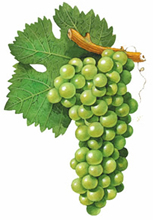 The Sauvignon Blanc wine chart is a full-color depiction of the Sauvignon Blanc wine grape, and includes a complete range of aromas and flavors found in Sauvignon Blanc wine. This beautiful Sauvignon Blanc poster is perfect for framing! See what the Cabernet Sauvignon wine guide looks like up close. TasteTour.com uses PayPal for secure online payments. © 2019 RONN WIEGAND, MASTER OF WINE, MASTER SOMMELIER. ALL RIGHTS RESERVED.